. 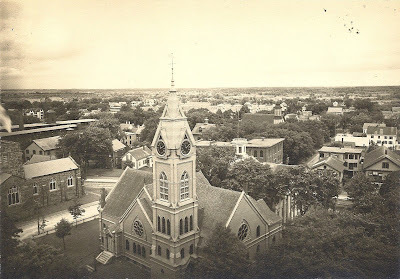 This view from the top of Middleborough Town Hall taken about 1902 depicts, most conspicuously, the Gothic Revival style Central Baptist Church constructed in 1888 to replace the previous church which was destroyed by fire. Behind the church, barely visible, is the white-painted Peirce Academy building with its distinctive cylindrical cupola. Across Union Street, the Church of Our Saviour is seen. On the north side of Center Street are (from left to right): the Leonard & Barrows Shoe Manufactory, the Briggs building which was shortly to be replaced by the original School Street School, the Otis Briggs House half hidden behind the large tree, the smaller white-colored Weston House, and the Glidden Block. Behind the Glidden block, the roofs of the School Street School and Central Methodist Church are seen above the treeline. East of School Street, also on the north side of Center Street, are the T. W. Pierce Hardware Store (demolished in 1940 for the construction of a First National Store - now Benny's) and Whitman's department store (demolished in 1968 for the Plymouth-Home National Bank - now Sovereign Bank).